Greetings from the Weaving Room! It’s another pleasant, late summer day in Missouri. The beans are slowing down and the tomatoes are trying to ripen before the squirrels get them. They are on their own. I’m working on a couple new warps! 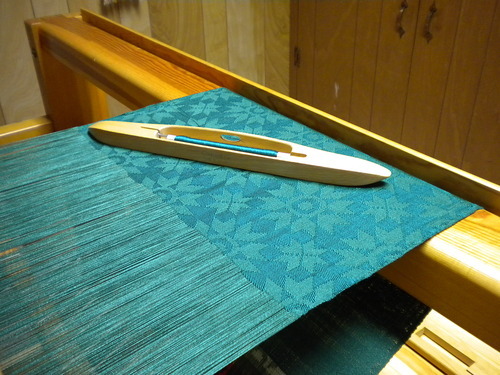 Last week, I put the draw attachment back on my Glimakra loom and rethreaded a damask warp, this one in forest green to grace holiday tables. I’m using a star pattern from an early coverlet which repeats for the length. The beauty of this damask threading is that I can change patterns at will and get a variety of designs on one warp. The other warp on my smaller loom is for hand towels. I combined a lemon yellow cotton with a daffodil cotton to make nice, thirsty towels. I just wish I had more of each color to use as weft as well, but alas, both cones are empty now. So it’s time to get creative in using what’s on the shelf: perhaps a soft spearmint green, perhaps a bold orange, maybe a paler butter yellow. We’ll see what works.